When the first trailer for Star Trek Beyond landed a few months back it had many fans of the classic franchise scratching their heads. For a series that often uses science fiction to ask deeper questions about humanity, there seemed to be an awful lot of things exploding. Simon Pegg even came out to relieve concerns and tell us that the trailer was not representative of the final film. Now Pegg is back and the co-star and co-writer of Star Trek Beyond is finally giving us some information about what the film actually is all about, which as it turns out, is questioning the core assumptions of the entire franchise. Speaking with Empire, Simon Pegg talked a little bit about the setup for Star Trek Beyond. As we had already heard, the film picks up two years into the Starship Enterprise’s five-year mission, and we find the crew more than a little worse for wear. They stop off at a Federation outpost which Pegg describes as a "diplomatic hub" to get a little rest from their ongoing work. It’s at this point that Idris Elba’s character, Krall, makes his appearance by attacking the outpost. You see, Krall doesn’t think much of the Federation or its ideals, but that’s where Star Trek Beyond really finds itself according to Simon Pegg. He says this random attack by an alien will cause the crew of the Enterprise to question their entire purpose. We’re gathering a great community within the galaxy, but to what end? What does it all mean? While this brief setup does look to have more than its share of things exploding, and there’s nothing wrong with that, what always made Star Trek great is something else entirely. The TV series and films would cause the viewer to look at themselves and ask questions about humanity in the modern day by looking at these people within a fictionalized future. Fans of classic Star Trek will likely be somewhat relieved to hear there are some more cerebral aspects of Star Trek Beyond to go along with the action. The newest Star Trek film is directed by Justin Lin of Fast & Furious fame, and continues the story of the rebooted universe begun by J.J. Abrams. We’ll get to see where a new director, and writer are able to take the final frontier when Star Trek Beyond is released July 22. Did you know that Star Trek is about to celebrate a MONUMENTAL anniversary? And that the producers have huge plans for a fan event that happens very, very soon. If you love Trek, you are going to want to know all about this. Read on! 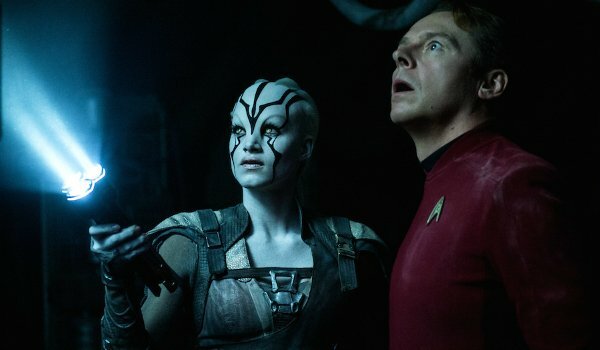 Attendees at CinemaCon in Las Vegas were stunned when Paramount concluded its footage presentation without showing anything new from Justin Lin’s Star Trek Beyond, It turns out Paramount was saving its Star Trek footage for a different event. What else do we know about Star Trek Beyond at this point? - Idris Elba is playing the main villain. Read about him here. - Simon Pegg reached out to fans when he hit a snag while writing the screenplay. Here’s what they helped him figure out. - There’s a revolutionary new way that Star Trek Beyond will be screened in select theaters. This one you HAVE to read about. - And finally, will William Shatner actually appear in Star Trek Beyond? Here’s what the legendary actor said.